The 83rd in this occasional series of reprints from Quote Unquote the magazine is from the January/February 1994 issue: Malcolm Walker’s Drink column on vodka. Malcolm has been mentioned here before, in connection with his cartooning. He is also a very good architect. I was present at this vodka tasting but do not remember much about it. I was first introduced to vodka as a one-shot drink when it came with blinis and caviar at the great, departed Flamingos restaurant. Oily, pungent, cold, and deeply alcoholic it was perfect with the caviar, sour cream and yeasty pancakes. Marvellous. Every drink has its traditions. Vodka’s are particularly savage. Scandinavian custom is for the host to toast, individually, each guest. A large dinner party is an distinct health hazard for the host. The Russians at the Yalta conference toasted the other Allies at every opportunity with vodka and soon had them under the table. Vodka can be a good negotiating tool – particularly as the Russians were drinking water. The simplest of the spirits, vodka is in essence ethyl alcohol distilled from a variety of bases, commonly grains or whey (not usually potatoes as commonly supposed) and diluted with water to around 40 per cent alcohol. From there differences are made by the base it is fermented from and the techniques of distillation and filtration. The trick of the brand is to avoid stripping too much of what little character the liquor had to begin with. The most common claim on the labels is “Purity”. Vodka is bought mainly as a mixer. Being pure, it’s ideal. Also, there are flavoured vodkas on the market: citrus and chilli are two available here. (I have friends who make their own by macerating the fruit in the bottle.) So, here we are with a drink that aspires to be colourless, odourless, tasteless and puts you on your ear faster than anything else on the market. Perfect for a comparative tasting! We got the style right – none of this top-of-the-bar stuff. The bottle should be straight from the freezer (alcohol won’t freeze) and poured into chilled glasses. First up: Stolichnaya (Stoli to converts), grain fermented and bottled in good old Mother Russia. As the frost formed on the bottle we got down to it. A heavy, oily quality, solid and a bit rough with a serious alcohol hit, and a sharp and aromatic nose. There was a bit of debate about where the alcohol bit in – somewhere between the back of the throat and the upper thorax. Next up, Moskovskya, with a similar label but this time bright green (remember that hint after you’ve had a few). “More potatoes” was the first reaction. Obviously from the same stable as Stoli (in fact, from the same factory), it’s a fuller and more volatile drink. A real wake-up call. The Poles claim they invented vodka in the 11th century. It seems the Russians didn’t pick it up until the early 1800s, so these guys should have got it right by now. The only Polish vodka we could get was a lightly flavoured one, Zubrowka, which features the “herb beloved by the European bison”. The bottle even contained a stem of the plant. Well, what can you say? Betterthan the worms the Mexicans give you. The drink had a definite bouquet of hay. And a definite taste of, well, hay. Closely followed by the now familiar grunty blast of Eastern-bloc alcohol, and a broader after-taste than the initial ﬂavour would suggest. Like the Russians, the Zubrowka is pretty hairy-chested, but less volatile. The Eastern European vodkas have been under pressure to make a cleaner, blander vodka to suit the international market. This may explain the difference between the Stoli and the Moskovskya. Zubrowka, l’d guess, is still pretty true to its original properties. For those who like their fun a bit cleaner we cracked a bottle of Finlandia. Much sniffing for a bouquet. Opinions varied from “none” to “vodka”. Only your chemist could tell. As for taste, it’s much sweeter but with less flavour. Not much here except alcohol and water is my guess. Very thoroughly filtered, as you’d expect from a Scandinavian. I’m bound to say it had a good Finnish. Absolut from Sweden, a grain alcohol, is a more volatile version of Finlandia. Obviously a high-tech drink too, compared with the more muscular Easterners, but with a bit more flavour – although exactly what is hard to pin down. It hits smoothly and is very easy to drink. You could do a lot of damage with this, the most stylish of the vodkas we sampled. Time for a good local drink: Smirnoff Blue, made under licence in New Zealand, and another high-tech grain vodka. What I like about it is that it has a 45.2 per cent alcohol content. All the others are around 40 per cent. Not surprisingly, it’s “hotter” and has a different taste, possibly because of the base. Still, it’s smooth, closer to the Finlandia than the Absolut. Nothing wrong with it. The manufacturers are at pains to point out how much the drink is filtered. Even so, it’s markedly different from the others. One of the panel, with a longer history of vodka drinking than the rest, suggested that it was “right”, more what she was used to. The New Zealand vodka style – didn’t know we had one, did you? So that’s vodka, the stuff a Russian tank crew recently swapped their tank for (two cases is the going rate, apparently). If you’re mixing it’s doubtful that the brand will matter much. For shot drinking, though, check the list, match the brand to your personality and go to it. Vodka, the drinking person’s drink. I’ve avoided mixers but I can’t resist a recipe. Vodkababs. This is from my favourite cookbook, That Was Simply Delicious But I Couldn’t Eat Another Mouthful: take a supermarket sponge cake, cut into cubes, thread onto kebab skewers, soak in vodka, roll in hundreds and thousands, set alight and serve. I haven’t actually tried it but I’m sure it will be a delight. As I said, anything goes with vodka. The Book Council’s Stephanie Soper came up with Yeah, Noir. Which is brilliant, and definitive. Yeah Noir it is. 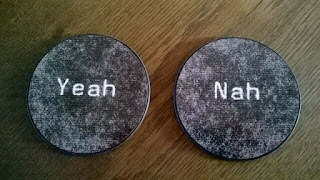 So here are my favourite coasters, bought in Cambridge, made in Raglan. Ethically sourced! 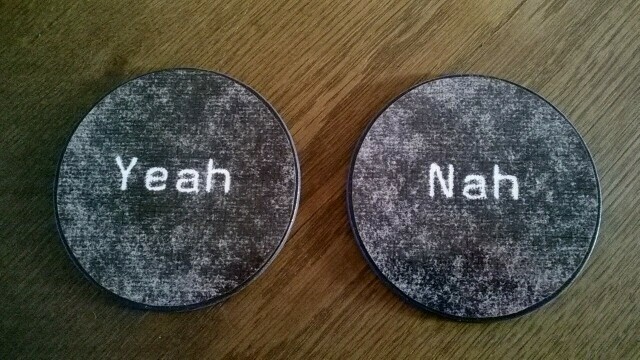 Tomorrow I shall try to commission the maker to make one that says “Noir”. In the few days I’ve spent in Paris, I’d say the terror alert level is fluctuating between a little antsy, really quite nervous and eye-twitching, hair-tearing, run for your lives woo-woo. The fear is that opposition spies will somehow learn England’s secrets. They’re clearly hoping opposition narks failed to notice John Stones’s last six months at Everton, Chris Smalling’s performance in the FA Cup final, or whatever the hell it was England’s forwards were up to against Portugal. Graham Taylor was another security-conscious England manager. In 1993, playing a World Cup qualifier in Oslo, he became convinced that the team co-ordinator provided by the Norwegian FA was a spy. On the eve of the game, Taylor switched training locations and, distracting the poor chap with a fake telephone call, instructed the coach driver to depart without him. England then trained at a military sports centre, watched only by local wildlife and the chief sports correspondent of Norway’s biggest-selling newspaper, VG, whose house happened to back on to the ground. Photographs, and every last detail of the secret training session, duly appeared on its front page the next day. There’s this phrase that comes up in publishing: ‘Sometimes you need to save an author from themselves.’ But you can’t every time. Who says they want saving, anyway? It’s a bit like giving someone advice on their dance routine. ‘Don’t do those jazz hands yet! It’s too soon! Do them at the end!’ Some writers will give you a withering look and do their jazz hands more energetically. I’ve had this experience when being edited myself. We were passing the tailgate grill parties and merchandise vendors when the argument began. If my eight-year-old daughter could impersonate a dinosaur in her class play, I reasoned, then for the duration of the “The Star-Spangled Banner” she could pretend to be an American. It would only last a minute or two, and thousands of baseball fans would be watching, plus many more on television, and if the rest of her school choir placed their palms on their chests in loyalty, she should, too. “But it’s not true for me,” she said, as an Atlanta cop waved us into a parking lot opposite Turner Field. “I don’t believe in it.” She was happy to sing, but she was British, and she would not consecrate someone else’s anthem by putting her hand on her heart. That, for her, would be a lie. Inside the stadium we left her in the mustering area, alongside a marching band in plumed hats and a team of majorettes, and went to find our seats. You don’t know them like I do. They’ve got it coming. · Scientists use “theory” to mean an explanatory framework, but the public use it to mean a hunch or speculation. · Scientists use “uncertainty” to mean the range of an estimate, but the public use it to mean ignorance. · Scientists use “positive trend” to mean an increase and “positive feedback” to mean a vicious circle, but the public use “positive” to mean good. It allows sentences to remain neutral without issues of sexism or discrimination, and with a succinctness and neatness that its alternatives lack. There is much more on the clumsiness generated by using gendered pronouns in genderless sentences. It’s grammatical “correctness” gone mad. A brilliant interview by Eleanor Black with Stephen Daisley, winner of this year’s big prize at the Ockham Book Awards. In some quarters there was criticism – muted, never in public, as is the New Zealand way – of a novel set in Australia written by an Australian resident winning the biggest book prize in New Zealand. Whenever I heard this I would ask, “Do you remember who won the 2013 award and for which novel?” No one ever did, which tells you something about awards. I would tell them that it was Kirsty Gunn, who lives in Scotland, with The Big Music, which is set entirely in Scotland. And no one said boo about that. Daisley’s parents Ken and Lal ran the pub at Raetihi, a settlement of 1000 people near Ohakune. “We come out of a very practical heritage and culture,” Daisley explains. “Someone who could shoot a deer or cut an acre of bush was much more valuable than someone who could write a poem. As a result of that you tended to just keep it to yourself a bit. From the edition of Wednesday 8 June. As always, spelling, punctuation, grammar and logic are exactly as printed in the Waikato Times. Recently a number of correspondents have likened government inaction on property inflation to Nero fiddling while Rome burned. This comparison becomes even more apt when taken in historical context. Today we assume that the fiddle was a violin; however, the violin had not yet been invented at that time. What Nero played was a lyre. Would playing the lyre be an archaic equivalent of “brain fade”; or was it just that Nero did not want an inventory of run-down houses that might be too expensive to rent if they were properly maintained?